We forget that less than a month after 9/11, Americans felt themselves under siege again. This time, the danger came from powdered anthrax sent through the mail in small, but deadly, amounts. The toll from the anthrax letters – five dead and 17 sickened – was a fraction of the toll from 9/11, but the letters were not the blip on the radar screen they seem a decade later. The anthrax letters helped legitimise a politics of hysteria. In a jittery nation, the letters took on a life of their own, smoothing the road to war with Iraq. For most Americans, the threat of anthrax became a reality on 5 October 2001, when Robert Stevens, a 63-year-old photo editor at the American Media tabloid, the Sun, died from inhalation anthrax, three days after entering a West Palm Beach hospital. The night shift doctors who saw Stevens did not initially suspect anthrax. With good reason. In the United States, there were only 18 reported inhalation anthrax cases in the entire 20th century, and those cases typically came from workers who had been exposed to animals with anthrax. When a co-worker of Stevens also tested for anthrax, the panic was on. It was impossible to believe two Florida anthrax cases in office workers were a coincidence, and by the following week, anthrax cases were being reported in New York. An aide to NBC News anchor Tom Brokaw tested positive for anthrax, and so did an editorial assistant at the New York Post. Most menacing in media terms, on 15 October a letter laced with anthrax arrived at the Capitol office of Democratic Senate majority leader Tom Daschle of South Dakota. “We have this anthrax. You died now. Are you afraid? Death to America,” the letter to Daschle declared. Making anthrax spores was difficult, but as the letter showed, using the mails to disperse them was easy. By November, all the country could be sure of was that anthrax posed a danger from which nobody was completely safe. The fifth and last anthrax fatality was a 94-year-old widow who lived alone in the small, rural town of Oxford, Connecticut. Who would do such a thing? Shortly after the death of Robert Stevens, two widely-respected foreign policy experts with no direct ties to the Bush administration offered their answers in op-eds that appeared on the same day and put the spotlight on Iraq. In his Wall Street Journal op-ed, “The Iraq Connection”, former CIA director James Woolsey pointed out that Iraq was the state “most likely” to support an anthrax attack against the United States and urged the government not to require “proof beyond a reasonable doubt” to make Iraq its focus. “Saddam has a festering sense of revenge for his humiliation in the Gulf War,” Woolsey warned. In the New York Times, Richard Butler, an Australian diplomat who had led the United Nations inspectors in Iraq, offered similar advice in an essay entitled, “Who Made the Anthrax?” Butler, like Woolsey, could offer no hard proof that Iraq was behind the anthrax letters, but he did not hesitate to name Iraq as his No 1 suspect on the basis of his personal experience. “I concluded that biological weapons are closest to President Hussein’s heart because it was in this area that his resistance to our work reached its height,” Butler wrote. For the Bush administration, Woolsey’s and Butler’s op-eds were political gold. Here were two independent figures (Woolsey had been appointed director of the CIA by Bill Clinton) willing to link the anthrax letters to the threat they believed Iraq posed for America. From this point on, any connection the Bush administration made between the anthrax cases and Iraq was guaranteed a respectful hearing. In September of 2001, before the anthrax cases occurred, Bush cabinet officials had spoken openly about the possibility of bioterrorism. In testimony before Congress, Attorney General John Ashcroft warned that in the hands of terrorists, crop-dusting planes could be used to distribute weapons of mass destruction, and a few days later Secretary of Defence Donald Rumsfeld announced that he expected America’s enemies would try to help terrorist groups obtain chemical and biological weapons. After Woolsey’s and Butler’s op-eds, President Bush himself took the lead in link anthrax, bioterrorism and Iraq. On 6 November Bush, speaking by satellite to a central European conference on counterterrorism, warned that America’s enemies are “seeking chemical, biological, and nuclear weapons”. A day later, at a joint news conference with Britain’s prime minister Tony Blair, Bush made the anthrax letters central to his remarks. “Never would we dream,” he told reporters, “that someone would use our own planes and our own mail to attack us.” He made a similar connection in his address to the nation later that week. The theme was one that Bush stuck to for the rest of 2002, and continued into 2003, when on 3 February in a speech at the National Institutes of Health, he promised that if Saddam Hussein does not disarm, the United States “will lead a coalition to disarm him.” With just over a month to go before the invasion of Iraq, it remained only for Secretary of State Colin Powell, the foreign policy moderate in the Bush administration, to make the case at the United Nations security council for a possible war with Iraq. Powell’s information was, as he later acknowledged, wrong. His had not given the UN “facts and conclusions based on solid evidence”. As he told Barbara Walters in an interview on ABC’s 20/20, his United Nations speech was a “blot” on his record. But equally flawed were the larger political assumptions about who was behind the anthrax attacks. 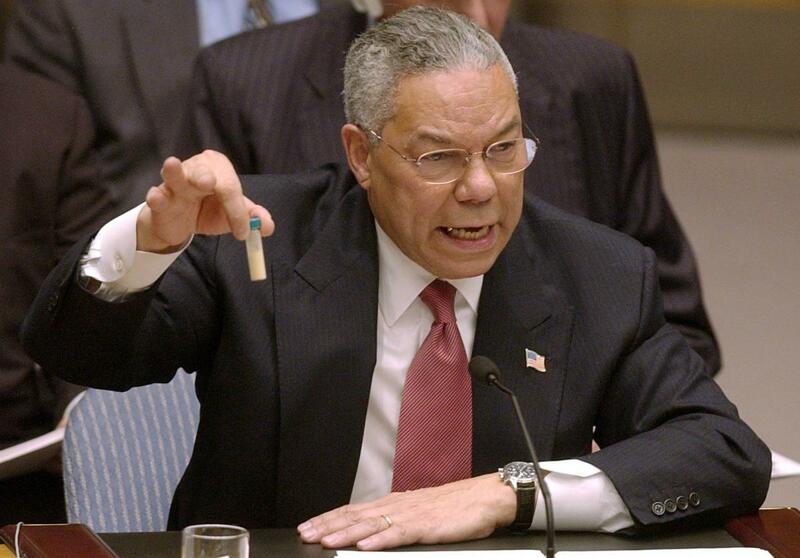 The person the FBI finally named as responsible for the anthrax letters had no link to Iraq. He was Bruce Ivins, a disgruntled scientist working at the Army’s biodefence labs at Fort Detrick, Maryland. He committed suicide in 2008 before he could be brought to trial. In March 2003, however, none of these failures in intelligence was apparent. An anthrax scare that should have been a freak sidebar to 9/11 had been successfully manipulated to cement the case on Saddam Hussein’s “weapons of mass destruction”, make military action against Iraq compelling and isolate opponents of the war.